i think we can safely say that picture-it's pageframes pretty much started the stampede toward the clear acrylic albums we're all loving at the moment. The transparent factor make these projects both challenging and beautiful. We hope you enjoy this stroll through some of what pageframes now has to offer. 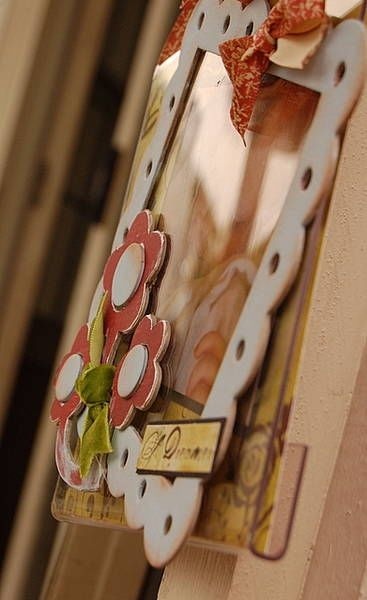 Donna wanted to create something meaningful for a friend's birthday - an alternative to a birthday card that, let's face it, are usually thrown in the bin or hidden away in a box in the garage. 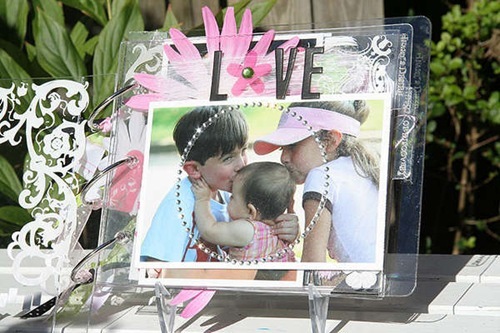 This simple, but elegant Pageframe Designs Easel was the result. 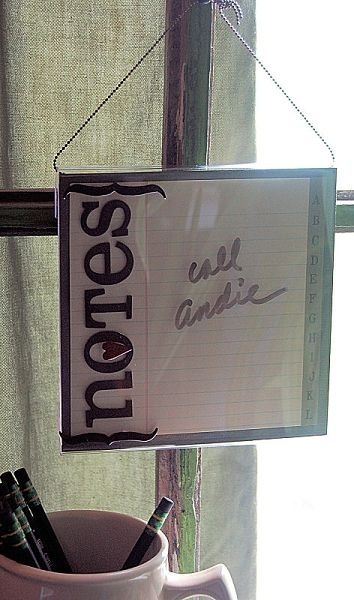 Donna used a Jenni Bowlin diecut pp to trace and cut her SEI cardstock to a slightly less obvious shape. 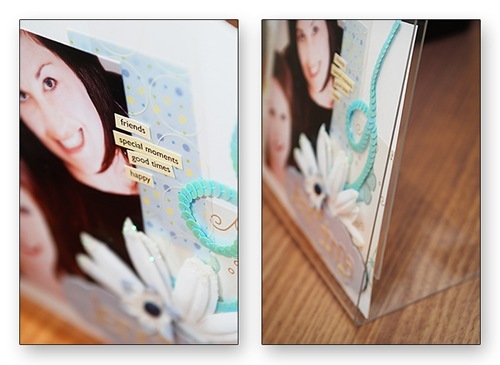 She then added a few simple pp's and embellishments to maintain the elegance and sentimentality of this gift. 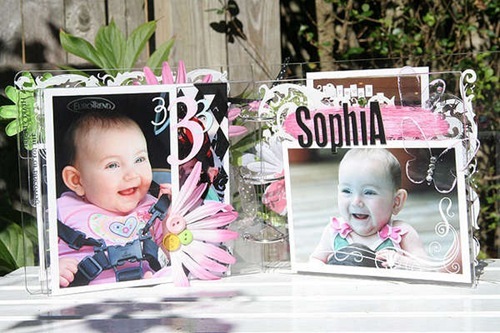 The easel's design makes it possible to create a fairly bumpy page without causing any warping or buckling of the page when displayed. 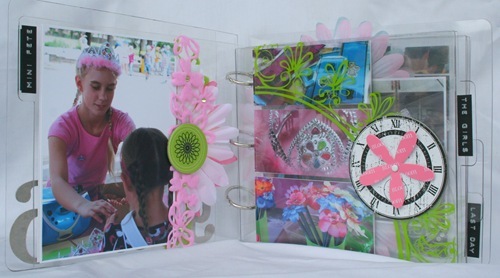 Caz has had a fabulous time working on this Pageframe Designs Clear 6x6 Album. 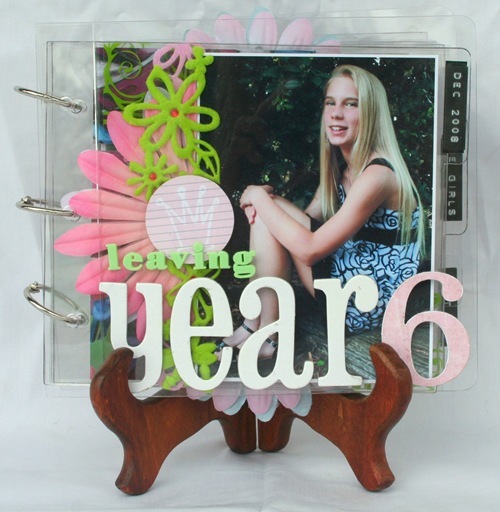 She decided to create an album of the end of year activities of her eldest daughter who was leaving year 6. Such a special and important time that it deserved an album of its own. The first section is of the Mini Fete that the kids have to raise money for their farewell dinner and a gift for the school. The kids divide into groups and have to make, advertise and then sell their own merchandise during a day that is not only great fun for the whole school but an important learning activity for year 6. The second section is of Darcy and her friends getting ready for the Farewell Dinner. They all looked so grownup in their dresses, new shoes and a touch of make-up. the night was held at the local club and the room was decked out just like a wedding. hey received graduation certificates from the principal and the parents joined in the last dance. A very special night for them all. The third section which is yet to be completed will be of the last day of school. The whole school makes a farewell arch that Year 6 goes through as a way of saying goodbye. Lots of teary photos in this lot. 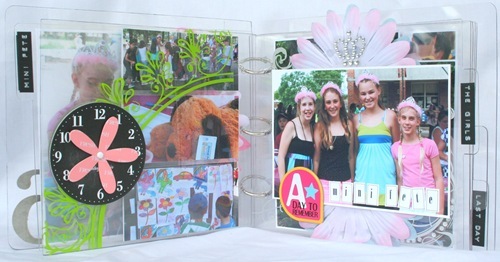 The beauty of the Pageframe album is that you can make it as lumpy as you like. Caz gathered together a big pile of her favourite products and just went to town. 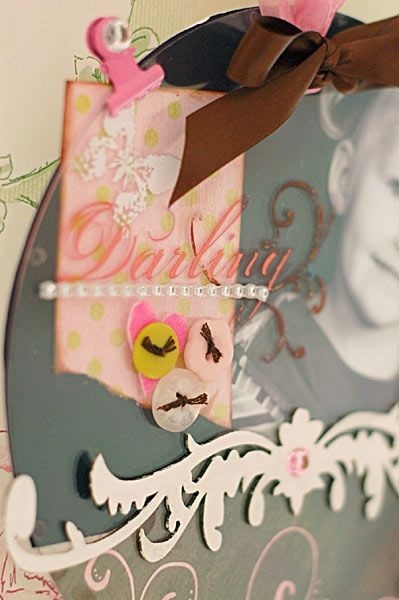 Heidi Swapp chipboard, Florals and Bling, heaps of the gorgeous Queen & Co Felt ribbon, silver Hambly rub-ons and lots of other little touches have gone together to make a keepsake that Darcy can treasure forever. 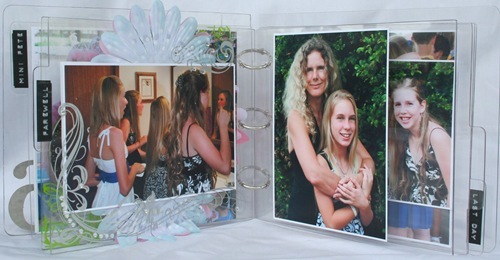 As you can see the pageframe album has tabbed pages which enable you to break up a special occasion whether it be a birthday, birth of a child etc etc into different sections. It would make a great present for someone special. So many of our layouts are seen but once in a blue-moon. Let's face it, it takes a little effort to get the albums out especially when there are little grubby fingers clawing at them the minute they are out in the open. An idea like these PageFrame Designs clear frames allow our layouts to be displayed in full view, just as Kimber McGray has demonstrated in her beautiful example, 'A Dreamer'. We love the the warmth and serenity of Kimber's lovely work. Thanks for sharing Kimber. This stunning piece of home decor comes to us from Betsy Veldman. 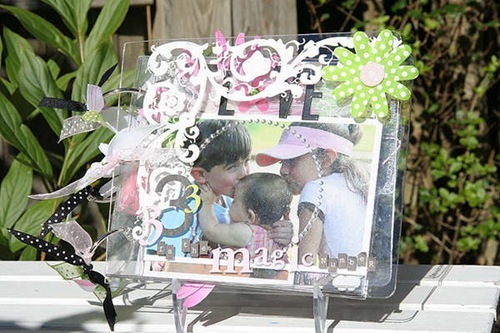 Betsy has used her PageFrame to create a beautiful peice of art that will be treasured for many, many years to come. 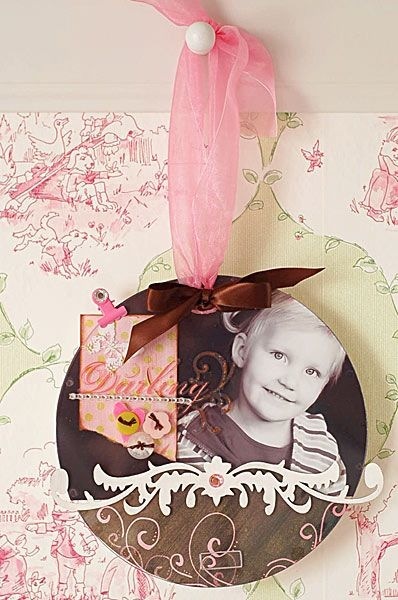 We loved this idea by twopeas member Judi. Not only is this PageFrame beautiful, but functional as well. Judi has proven that it pays to think outside the box. 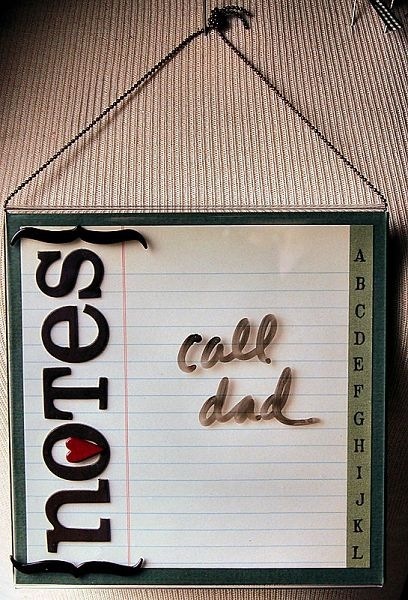 This memo board, created in the style of a whiteboard, would be a useful addition to any home and may just capture the attention of those 'must-be-organised' men in our lives too! 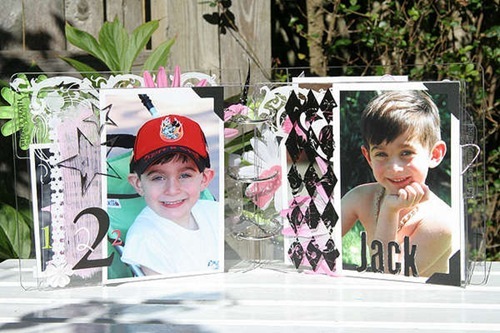 This beautiful page-frame clear album by Gina Barone first caught Caz's eye as it was called "3 is the magic number" as Caz has 3 children as well and sometimes ponders what the 'magic' number actually is. 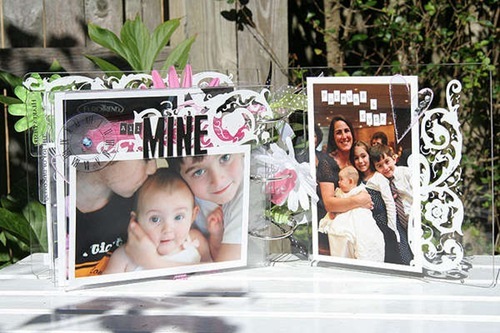 Gina has given each of her 3 children a double page to themselves and then has filled the rest of the album with loving photos of the children together. The beauty of the clear albums is that the embellishments can be seen through the previous pages giving it incredible depth. The acrylic pages can be used exactly like traditional pages, they aren't too thick to have holes punched in them for brads, tying ribbon etc. 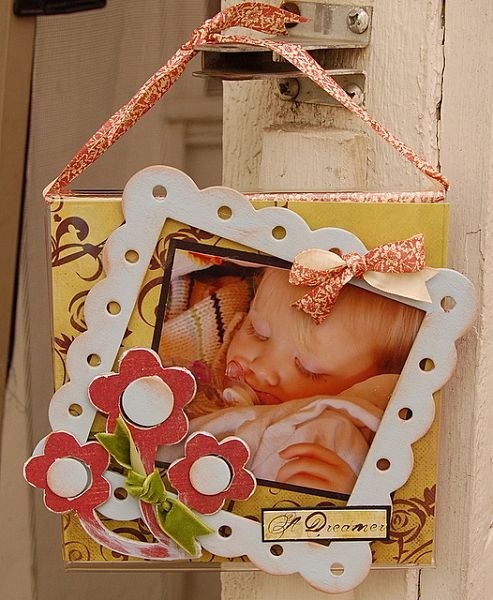 Gina has decorated her album with some the following -Heidi Swapp-rub-ons, bling circles, chipboard letters, puffy sticker, ghost heart, star butterfly and clock, Hambly-rub-ons and Queen and Co. flowers.